A joint effort between the Ayuntamiento for Ronda and the Junta de Andalucía to clean up the terrible pollution in the Tajo del Abanico was today announced by Alberto Orozco, Ronda’s councillor for the Environment, with an expected cost of 200,000€. 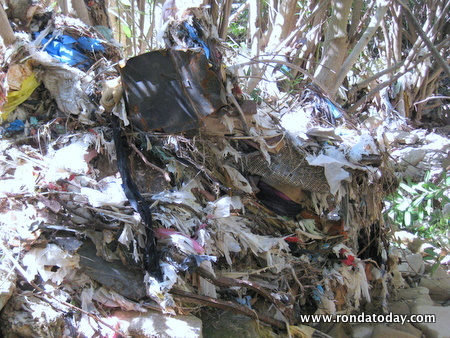 Ronda Today has quietly campaigned to have the river cleaned up after we took photos of horrendous pollution whilst filming our video walk in the Tajo several weeks ago; see our Tajo del Abanico Ronda walk. In fairness to the Ayuntamiento, the current pollution levels were caused by the flooding of late December 2009 which affected many parts of the Serranía de Ronda causing widespread road and property damage, however Ronda Today is very pleased to be informed that restoring the natural beauty of the Tajo del Abanico has been given a high priority at local and regional level. A nearby area was until the early 1990s used for city waste, being home to the landfill until this was relocated away from the city. However the heavy rains over winter damaged the old landfill causing tp soild to run off, resulting in thousands of plastic supermarket bolsas becoming entwined around the trunks of several river trees. Ronda Today has spotted old tyres, brake cylinders, metal paint cans, and other items of waste in the river, though this cleanup initiative is expected to fully restore the river to its former clean state. I hope the funding goes far enough to clean up the debris. This would be a good opportunity to recruit some of the unemployed to do valuable work. A U.S. example is the California Conservation Corps. It’s also a good opportunity to mitigate the agricultural wastes from local livestock farms. Years ago there were projects that involved collecting pigs’ waste, and putting it into “digesters” to produce methane that was then burned to heat the farms. While these projects may not have turned a profit, they did break even, the savings equivalent to the investment, within a couple of years. This is just one example of low-tech help to improve water quality.